BAY POST INTERNET: Is Kriseman protecting the "buy local" effort or pandering for political support? 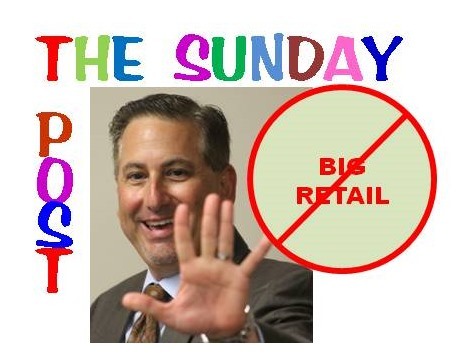 Is Kriseman protecting the "buy local" effort or pandering for political support? There are a lot of big players with dogs in this hunt. 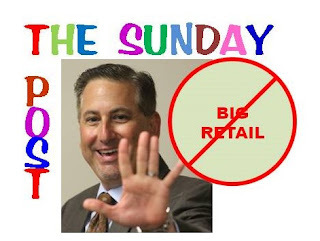 St. Pete Mayor, Rick Kriseman would like to protect St. Petersburg's local downtown retailers from the giant retailer boogieman. You can get more detail from Charlie Frago Tampa Bay Times Staff Writer; Mayor Rick Kriseman (kind of) has a plan to keep chains invading downtown St. Petersburg. The plan seems to be to craft an Ordinance applying some broad-brush criteria that would require a national brand or a local or regional firm with multiple locations to get a variance before they can open a retail outlet in the corridor along Central Avenue from Beach Drive to 31st Street. Not too surprising was the quote from the Frago article by the St. Petersburg Area Chamber of Commerce president and CEO Chris Steinocher, who said, "The City needed to preserve its special character and not fall prey to previous boom towns that became homogenized as they grew and developed." Keep in mind Steinocher's constituents are mostly small businesses in downtown St. Pete. It didn't take the Tampa Bay Times long to react see Times Editorial: St. Petersburg throws away welcome mat for top store brands. The editorial makes some good points about the problems implementing and enforcing such an Ordinance, but also keep in mind there are a lot more advertising dollars from those big retailers than there are from the mom and pops along Central Avenue. Point is there are a lot of big players with dog's in this hunt. One of the really genuine concerns in this whole issue is something called gentrification. Basically, the issue is when wealthier individuals or businesses move into a developing area like Central Avenue, rents and property values have a tendency to rise. Often these rising rents result in those smaller businesses that helped established the area no longer being able to sustain their profitability due to the increasing rents. What frequently follows is a downward spiral of the area and community creating significant problems. Gentrification is a major issue in residential and retail areas and some reasonable efforts to control it are probably in order. It is a tough issue since individual property rights are front and center and any attempts by government to control the use of private property usually result in a strong response. The timing of all of this is interesting. I am not sure who Kriseman is trying to drum up political and financial support for his reelection from. The whole thing sounds kind of Trumpesq to me. It did not take the Tampa Bay Times long to sum up the Mayor's latest pitch: This is the kind of well-intended but half-baked proposal that undermines confidence in the Kriseman administration.